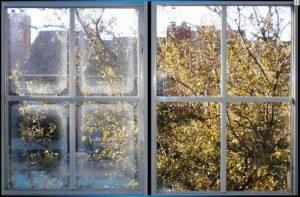 Apart from screen oxidation and hard water stains, vacuum seal breaks are one of the most common defects we see in home windows. When a vacuum seal in a double pane window breaks (or is “blown”), it causes air and moisture to get between the panes. The window on the left has a broken vacuum seal. There are a variety of ways that the problem will present itself. Sometimes, you can see fogginess and even moisture between the panes. Occasionally, the window will have a rainbow look (like you might see on an oil slick) when viewing it from the outside looking in. Often you’ll see what looks like spots or streaks on the window. 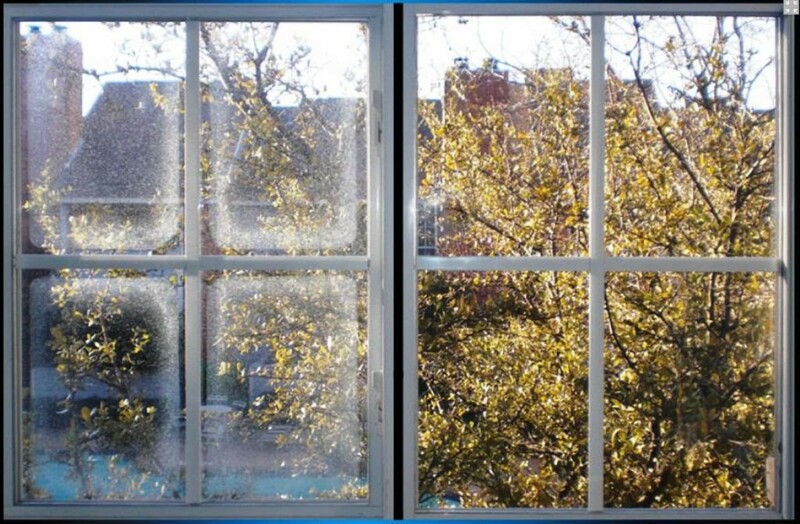 When the problem presents as spots or streaks, it can look like the window simply needs to be cleaned. From the outside, the spots and streaks will appear to be on the inside of the window. Looking from the inside out, however, it will seem as if the problem is on the outside of the window. In reality, what you are seeing is in between the panes and therefore cannot be corrected by cleaning the window. Broken vacuum seals are commonly caused by either defects in the window, strong storms, or even excessive water pressure used when power washing your house. That is one reason why Mr. Wright’s uses a soft wash technique when power washing (see here). Once a window’s vacuum seal is blown, it is time to replace the window. The problem will get progressively worse until you may no longer even be able to see through the window. The first thing you should do when you notice the problem is contact the window manufacturer to see if it is under warranty. Anderson windows offers a 20-year warranty against vacuum seal breaks. Some manufacturers will offer longer, and a few even offer life time warranties. It’s important to check, even if you aren’t the original purchaser of the window. The warranty will usually only cover the replacement cost. Unfortunately, you will still bear the installation cost, which is often equal to the cost of the window. If you aren’t sure whether problems you are seeing with a window are caused by a vacuum seal break, let us know and we’ll be happy to come take a look.